1.1 How is this compare to PhoneGap? AppStudio now supports the use of some of the most important new technologies in the web development world. npm is a repository of code which can be used with Node.js. It's included when you download Node. There is a huge number of packages available - over 750,000 at last count. You can include these packages in your Node project to add functionality. It might be for convenience: there are a lot of libraries which are much easier to include in your project than to write yourself. It might be for functionality: the modules can implement features which would not be available in the browser. How is this compare to PhoneGap? PhoneGap (Cordova) is used to package apps for iOS and Android. Electron is used to package apps for Windows, MacOS and Linux. It's quite reasonable to have one AppStudio project that you use with both PhoneGap and Electron, letting you build for all 5 platforms. Nodejs/npm modules are similar to PhoneGap Plugins. Since they are operating system specific, PhoneGap Plugins will not work with Electron (and vice versa). In this tutorial, we're going to use a module from npm called weather-js to create an app which gets weather data from weather.service.msn.com. It's very convenient: we don't have to figure out the MSN API to use it. You will have to know how to use the command line (Terminal on MacOS, cmd or Powershell on Windows) and have AppStudio 7.3.0 or later installed. 2. 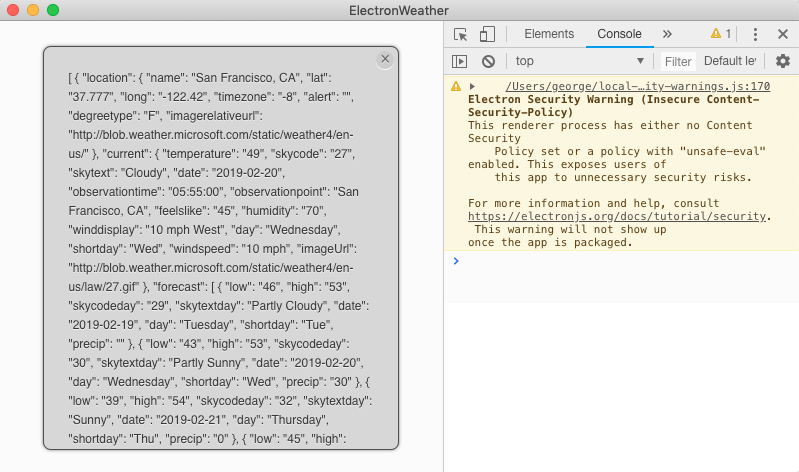 Using AppStudio, create a new project called ElectronWeather and save it. 5. 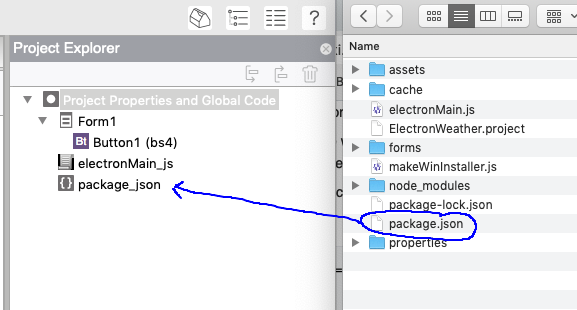 Drag and drop package.json into the Project Explorer window in AppStudio. This adds the file to the project. 7. Create a file called electronMain.js in your project folder, with the following code in it. For more information on this file, check out electronMain.js. 8. 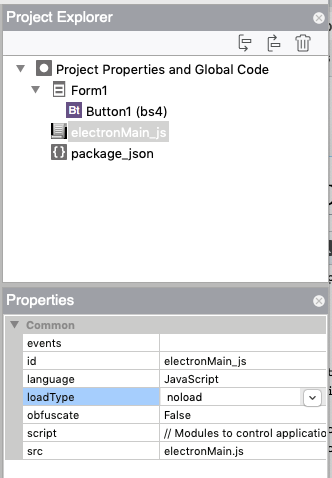 Drag and drop electronMain.js into the Project Explorer window of AppStudio. In the file's properties, set loadType to 'noload'. 1. Add a button to Form1. 2. In the code window for Form1, paste the following code. You'll notice there is a new function called 'require' in the first line. This function is part of Node.js: it loads the module of that name. 2. In AppStudio Preferences, select 'Deploy to a local folder' and select a folder to deploy to. 3. Click on Deploy in the Run menu. 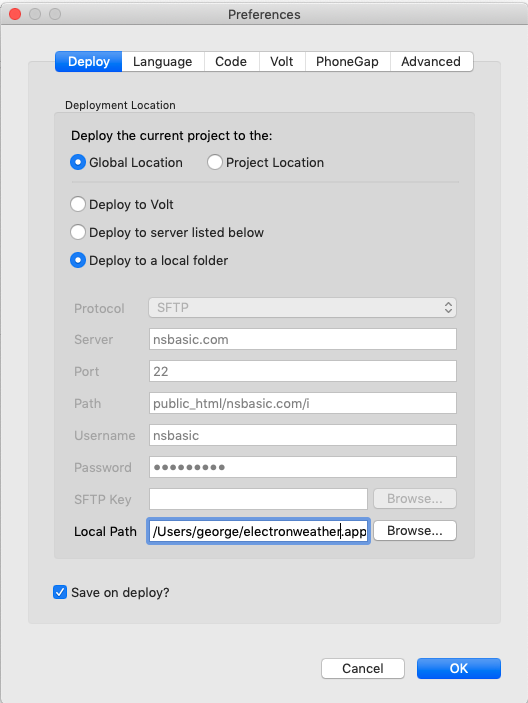 This will deploy your app to your local-deploy/ElectronWeather. It will ask you if you want to visit the project - click no. This will install all the node files needed to run your project. You won't have to do this step again unless you change the node modules your app uses. The Chrome Debugger window opens by default. We'll need this if we are going to debug the app. To turn off the Chrome Debugger, comment out line 18 in electronMain and run again. The "Electron Security Warning" in the console can be ignored. 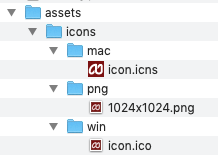 You probably noticed that your app is using the Electron icon to identify itself. You'll want to use your own. 2. Put 'assets' into the manifest property in Project Properties. 3. Save and deploy so the new assets folder is copied into local-deploy. We now have a running app. The next step is to package it for distribution. We can make regular executables for distribution on MacOS, Windows and Linux. The packaging has to done on a computer running the OS we are targeting: the MacOS version needs to be build on a Mac, etc. 2. Save and deploy again so the updated package.json is in local-deploy. You will want to compress the file so it can easily be distributed as a zip. When complete, you'll find the executable here: local-deploy/ElectronWeather/release-builds/windows-installer. This page was last edited on 22 February 2019, at 18:45.